I'm sad to say that Codex: Cult Mechanicus left a lot to be desired in my opinion. I'm sure there are enough reviews out there discussing rules; I won't be, right off the bat I'm going to tell you this. As one who appreciates Warhammer's lore far and above the game itself, I'd like to try and compile a few thoughts about the codex itself rather than rules. I will not say anything against there being only 6 units and 20 weapon types covered in 23-odd pages of game-related content out of an 80-page book. That's irrelevant, but what is relevant is the backstory you're given to work with. In the end it was all a little painful to read, rather forced, all a bit rushed. Almost as if they had a handful of edgy words they wanted to squash in as much as possible, so they worked their sentances around them. Actually, that seems to be a common feature through everything here. Their talk of chants and hymns, their talk of the power the dominium hold, it's all so... glossed over, so surface quality with no body to the intracicies-- Throne, don't get me started on how silly "sanctus canisters" sound. I probably have worse writing skills than they, so I'm in no place to argue but I didn't like the way the backstory was portrayed, so there. Much. Also I didn't like sanctus canisters. Never mind the improper grammar, it's basically "canisters containing holy". What will they say next, I wonder? Subito helm? As for the art, I commend them for crapping out all new images to use but the miniatures very obviously came first and the art suffers because of it. You know, I think that this might be a fault of the miniatures themselves... please understand, they aren't hideous sculpts in the slightest-! The amount of detail put into them, however, might and will destroy the imagination of, not only hobbyists but illustrators who now go to draw them. 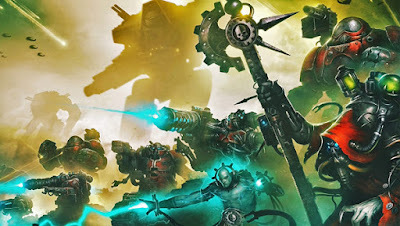 Let me now go a bit off-topic: do you remember in the past, a time when the mechanicus were a nebulous subject, always there but only seen in the forms of tech-priests and techmarines? Do you remember when the skitarii were mentioned in a 40K novel? Do also you remember how you used to imagine them, as you were struck with horror at their shattered humanity? And what about now that their codex has been released and your mind has been saturated with images copied straight from the miniatures? Of course, if you like the way the skitarii have gone, I'm happy for you; it's just that I'm not-- because flock the norm-- that's why I'm making my own. Without sanctus canisters. I'm not sure what kind of free reign the illustrators were granted in their work, but there doesn't seem to be much love put into it all. Uninspired, that's the word I'm looking for, uninspired. They are exact copies, like I said before, and the poses are very forced and stilted, but not in the proper awkward, I'm-Running-On-Half-A-Brain stilted. Sanctus canisters... This particular work portrays one particularly intriguing facet of the older 40K style-- ridiculously bulky, oversized equipment. Is his power axe steam-powered to be so huge? THIS I like. He must have such trouble using it but he knows no different-- or perhaps the frustration makes him feel holier. Another nice addition was the inclusion of the ever-faithful. Individual automatons, or maybe a few in a group, wandering aimlessly and fighting on whatever battlefield they find allies to fight for, this kind of story is-- I was going to say intriguing, but I've already said that a few times... Oh well! It is intriguing! For example, can you imagine an indie game like Inside or Journey where you play as a kastelian on some unknown pilgrimage? The visual, dialouge-less storytelling you could get out of a mute automaton would be so compelling! I'm afraid I can only say so many words about 80 pages, and I think that's that, really. In summary, not too chuffed, which is a pity. They hadn't descended very far and even now the lights were dimming; but surely not, were they not promised a swift and clean mission? The hive was oblivious to their intention, it would fall without challenge, all it would take is one seed and a forest of decay would sprout. Corporal Vellis had taken his turn along with his platoon to help bear their sickening brother-in arms on the iron litter toward their goal-- the depths of the midhive slum, where the lattice of catwalks and sewage systems would make it all the more difficult for any loyalist search party. In the darkness it was getting difficult to shut out the guardsman's incessant moaning-- he had drawn the short straw, he'd accepted his role! The corporal struck him again and told him to be silent. He ought to be thankful for his gift! By now the resonating thunder had increased to the point where all were affected-- as had the pressing blackness. Throat-lights refused to ignite and it was left to Crow to light the way with intermittent bursts of promethium. Nobody had noticed half the platoon were unexplainedly missing. The auspex flickered and died. The angle dictated led to a corridor leading to a spiral staircase, more than likely from some dead nuclear plant; the doorway was narrow and Crow opened fire, consuming the space with flames. Then the beast shot forward into a screaming mess of flesh and blood. It was an Astartes biker-- Grandfather save them, a biker in the underhive! The Sagodjur Fjorlag are not terribly fond of bikes in general, but having seen the success of other Chapters with them-- namely the sons of the Khan-- the librarius set out to build their own. And this is what happened. Riding at mad angles to turn square corners or descend staircases, these Altered Steeds carry out lighting assaults in ridiculously confined spaces where jump packs won't help and no other vehicle will fit. This is what I make when I lose to a player running eldar jetbikes. I must admit, to begin with I wasn't sure where the hell I was going when I began this chap. 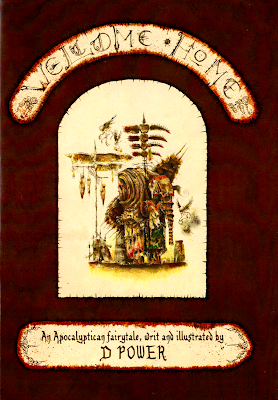 I went for an almost pantomime horse figure (with obvious Otherworld influence in the servitor in the front). They are Sagodjur, after all. I'm surprised at how pleasing the pose is, even if it is difficult to photograph; I think the cape really helps the overall sense of movement, it came from the WoC chariot. This is where the horse front half came from. I must add I wanted to continue with my jetbike kitbash, I'm not sure why I haven't... I'm sorry. Painting wasn't too big a deal; I'm still learning about drawing the eye with spot colours, which is why I like giving my Astartes bare arms/heads/feet, the clean whiteness of their skin contrasts nicely and reminds one there are living beings under that sewage-coated plate. "Repent, thing of the abyss"
One thing I'm not sold on, I'm afraid it has to be the twin-linked bolters. One day I might get around to replacing them with something less... orky. So there we are! So happy with the result I started work on a second immediately! I was hoping to aim for a full squad with an attack bike, but I'll need to source some more horses. And bikes. Here's where I'm up to so far with the second Altered Steed. I posed the rider in the middle of a turn, but the horse's head wasn't; to fix that I cut a wedge out of the neck and turned it upside-down, turning it a bit before fixing it in place. More greenstuff will come shortly. And that's that. If I don't finish him soon then I'll more than likely start yet another project... oh well! Bye bye for now. Know this, still they fear! And what does an Astartes fear? What? I shall tell you. Betrayal. The unknown. To fall without thought into madness. To be left behind. To be unremembered. Do you understand? Commander Phaleg IX to Inquisitoral interrogators post-combat, in an attempt to explain the questionable nature of their recently uncalled-for allies. You might not think it, but I am very interested in subconsciousness and the dream state; I think this is why I like Konami's classic Silent Hill so much, along with titles such as Psychobreak. Symbolism and the representation of the undepicted is very important to me, and the unseen fear cuts deeper than cheap screamers ever could. While sitting with a skitarii's shoulders drying between my fingers I had a far-fetched and strange thought; how much of the grim drak future is really, truly physical? I have almost no proof of this and there's no reason for me to pursue this theory, but it's a thought all the same. Who knows what thoughts humanity had during the age of discovery, when sublight travel was all they had? Firstly, let's discuss the presence of xenos, as that's the easiest to explain away. Please remember that this is only food for thought; in no way am I pursuing this as possible canon. Of the thousands of kinds of alien encountered in the grim dark future-- note I don't refer to the 41st millennium exclusively-- the most widely-known and feared factions are those that GW have produced kits for. Why are these xenos all so common, and all depicted so similarly? Thoughts spread throughout the Imperium; when one person tells another, that's twice as many who think as before, but descriptions will vary. What relevance does this have? Let me now remind you of anxiety-based hallucinations, more often than not encountered in small children between the ages of 2 and 10 but sometimes reported amongst adults, though this is rare. The infantile mind has not properly developed and everything is so much more vividly imagined. D'you have some childhood memory of a beach or perhaps your first trip to a really big shop? While the memory remains intense and exciting, the magic of the actual location is lost as one grows older, because-- simply put, the mind has grown up and has learnt to put away such free emotion. What about in the Imperium's case, though? Fear of death is a large thing, particularly amongst the richer, better-off classes as they know these worldly pleasures are the only heaven they'll be accepted into, so what does mankind do? For the most part they'll intoxicate themselves with drugs and hormones, or fill their hearts and brains with wire and bits of iron to put off dying for as long as possible. Can you imagine what this would do to a body, a mind more importantly? The desperation, the chemicals, to say nothing of the mutation that comes with radiation and inbreeding, the havock it would inflict on a developing mind would be terrible. Drug abuse too, of all kinds, is considered a pivotal key in developing schizophrenia among other disorders. ...Where was I going with this? The xenos are collective fears made manifest in people's minds; the unkillable foe in the Necrons, life's hopelessness in the tyranids, the fathomless knowledge of the Tau, do you understand? Those people "in the know" will unconsciously associate these trains of thought with certain imagry and so the xenos species are created. Emphasis on the "in the know", for to quote the 3rd ed rulebook, "Many citizens labour their entire lives, overcoming strife and toiling hard... without even being aware of the Imperium except as a children's story." For these planets out of the loop, theirs is in fact the kindest of fates in this regard, but that's not to say that they have no concerns with the psychological, either. Secondly, the Space Marines. That's pretty easy too. In all their troubles, figmented and otherwise, mankind dreams of a hero that would come down and save them. Let me tell you an interesting thing that happened to me; I was once made to attend an appointment or two with an actual psychiatrist to try and better understand my morbid outlook on life. I didn't enjoy it much, so I feigned a certain mindset for the duration just to see what'd become of it. I was given a number of tactics to try and deal with my "emotional roadblocks", one of them was to imagine my fear as such a creature, and then overcome it with such an emotion depicted as such a character. D'you understand? Space marines, among those who have heard of them, all imagine them slightly differently and this is how we get the differing chapters. Man is born with an innate desire to worship something, and it is up to him to find it; in this godless future they will begin to revere these imaginary heroes as if they were truly there to be worshipped. And with that reverence comes fear, maybe hate. What would become of our heroes, were they to ignore our plea? What if we did such a thing, would they hate us for it? What if they didn't want to protect us anymore? These thoughts grow in intensity and the chaos Space Marines are imagined, warring with mankind and their own imaginations. What then is the Imperium doing, to suffer the affects of a horrific war that isn't really true? That's where I get to the last point-- excuses. Yes, that's all it is, excuses for catastrophes mankind inflicts upon himself. War in general to the dread exterminatus are all wounds of some darker and more confusing thing that man chooses not to accept and imagines otherwise. In real life I believe in dead space-- lifeless stars, empty planets-- I believe we are truly alone in this universe. Mankind's friends (and, by extension, his enemies) are those he imagines and creates for himself, and this is the facet I find most intriguing in Warhammer 40K; the war within, the Imperium constantly turning upon itself in civil wars and corrupt allies. There are uncounted trillions of humans scattered across the stars, all thinking, all fearing-- can you imagine the psychic presence that would have? Once again, I'm not trying to impress this upon you. Hell, I don't believe it myself. You know, if I wanted to press a point I'd try to make it at least a little less of a pain to read, but that's that. You'll never think of the grim dark future the same way now, thank you for letting me ruin your hobby ;) If you have any thoughts or maybe a question regarding this pointless topic, don't be afraid to share! In case you hadn't noticed, I've discovered the beauty in classic Wayne England. Poor soul. Requiescat in pace.